The company was founded in 1981 by Craig Jensen and was originally named Executive Software. Mr. Jensen is Chairman of the Board and CEO of Condusiv Technologies. Condusiv Technologies creates high-performance software that optimizes and maintains application performance and efficiency, extends equipment longevity to make technology, people and businesses more productive. From the moment Condusiv software is installed on physical or virtual systems, our technology ensures data performance is automatically optimized. Requiring zero overhead, our energy-efficient, "Set It and Forget It"® solutions are used by over 90% of the Fortune 500 and almost three-quarters of The Forbes Global 100. Our customers include thousands of global enterprises, government agencies, independent software vendors (ISVs), original equipment manufacturers (OEMs) and home users worldwide. With over 30 years of cutting-edge product development, we lead the market in data storage innovation, delivering thought-leading technology that improves your business and user experience. Condusiv solutions help technology function at peak levels, increasing the productivity of people and business. We believe that technology should function and perform at peak levels. And users should benefit as promised. Condusiv products are designed to help you overcome technology limitations, realize your potential, and achieve what’s possible. Our mission is to provide market-leading, innovative products and services of superior quality that enable technology and empower users. Condusiv should be thought of as a "necessity" for anyone who wants their technology working hard for them and helping them achieve their objectives. Everyone knows the frustration of a Windows® system becoming progressively slower the longer it is used and burdened with more software and data. Condusiv’s Diskeeper® 15 prevents degradation in Windows performance and associated storage by preventing fragmentation from occurring at the Windows level in real-time, before files are written in a performance-penalized state. Everyone knows the frustration of a Windows laptop or workstation becoming progressively slower over time. Condusiv’s Diskeeper 15 Professional prevents degradation in Windows performance by eliminating nearly all fragmentation from occurring at the Windows level, before files are written in a performance-penalized state. IT administrators who manage a fleet of laptops and desktops, should consider V-locity® Endpoint, the next evolution beyond Diskeeper 15 that includes DRAM caching. With its patented, proactive IntelliWrite® technology, Diskeeper 15 keeps laptops and workstations running like new, resulting in increased productivity and lower costs by extending the useful life of existing hardware. Where typical defragmentation utilities consume resources to operate, and perform defrag after the performance penalty has already been incurred, Diskeeper 15 is the only proactive solution that solves the problem in real-time while running transparently in the background. Without Diskeeper 15, files are scattered around a volume instead of written in one place. Diskeeper’s IntelliWrite technology optimizes writes and subsequent reads by writing data sequentially, reducing seek time and the number of I/Os required to write a file or access it. The new Diskeeper 15 Server expands its patented fragmentation prevention technology beyond Windows physical servers with local storage and direct-attached storage (DAS) to now include storage area networks (SAN), representing the industry’s first real-time fragmentation solution for SAN storage. Diskeeper Server doesn’t "defrag" SAN systems or compete with RAID controllers for block management, but rather prevents fragmentation from occurring at the logical disk software layer in the Windows file system to keep physical servers and SAN storage running like new. Organizations who have virtualized should consider V-locity®. Where typical defragmentation utilities consume resources to operate and deal with fragmentation only after the performance penalty has already been incurred, Diskeeper 15 is the only proactive solution that solves the problem in real-time while running transparently in the background. 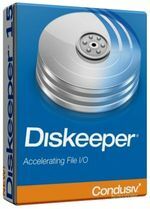 Without Diskeeper 15, files are scattered around a volume instead of written in one place. Diskeeper’s IntelliWrite optimizes writes and subsequent reads by writing data sequentially, reducing seek time and the number of I/Os required to write a file or access it. Diskeeper 15 Administrator saves you time and money by providing complete centralized management of Diskeeper/V-locity operations for all machines on your network, including installation, configuration, monitoring, updating, email reports, alerts and more. With simplified, "policy-based" management of clients in existing or newly-defined groups, you can handle the problems of file system performance across your entire site without ever leaving your desk! Diskeeper 15 Administrator makes deploying and managing Diskeeper and V-locity on even the largest sites very simple. All computers suffer from file fragmentation and need Diskeeper; but with hundreds or thousands of workstations and an increasing number of virtual systems on a network, trying to install and configure each one individually would be a time-consuming task. Keeping track of all of them would be nearly impossible otherwise. Diskeeper 15 Administrator edition saves you time and money by providing complete centralized management of Diskeeper/V-locity operations for all machines on your network, including installation, configuration, monitoring, updating, email reports, alerts and more. Diskeeper software is designed to truly improve the performance and reliability of your entire network. Diskeeper 15 Administrator utilizes the Microsoft® .NET framework, and can store data on an existing SQL server® or SQL Express database on any workstation. Diskeeper 15 Administrator makes it easy for you to keep your servers and workstations automatically set to maintain peak performance and efficiency every minute of every day.